1996. [Englisch] - 374 Seiten, 259 Abbildungen, 33 Tabellen. In 1842, the Canadian geologist Abraham Gesner discovered the first fossil fish in the cliffs of Miguasha, an area in eastern Quebec known as Scaumenac Bay which yielded one of the richest and most diverse Paleozoic biotas preserved in the Devonian Escuminac Formation. Especially the fishes and plants of this assemblage have been extensively collected and studied by many paleontologists from around the world. 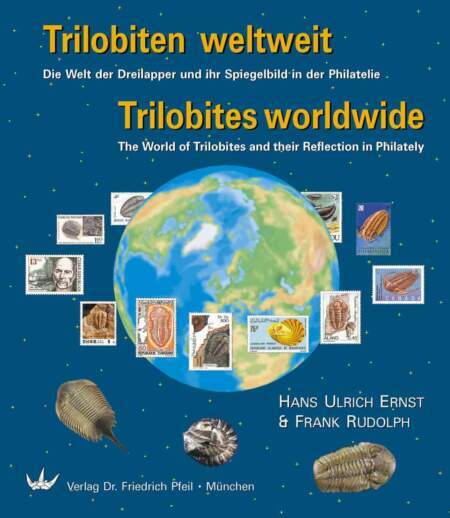 That started with the publications by the Canadian paleontologist J. F. Whiteaves in the 1880ies, continued by two famous British paleoichthyologists, A. S. Woodward and R. H. Traquair, at the end of the last century. During this century, Miguasha was visited frequently by American and European scientists so that the flow of publications continued. Private collecting by local families supplied the scientists with additional and new material. Since 1981, the cliffs of Miguasha have been a provincial park to assure protection of the site. Scientists from all over the world met for the 7th International Symposium on the Studies of Early Vertebrates at the interpretation center of the Parc de Miguasha in 1991. Exceptional state of preservation, abundance and evolutionary significance of the fossils make Miguasha a world-class locality. Among the fossil fishes found in Miguasha, Eusthenopteron became the keystone for our understanding of one of the most important steps in vertebrate evolution, the conquest of land. E. Jarvik, Stockholm, made Eusthenopteron the best studied fossil fish to such details as the course of nerves and blood vessels. Also found at Miguasha is Elpistostege, which is even closer to tetrapods than Eusthenopteron. 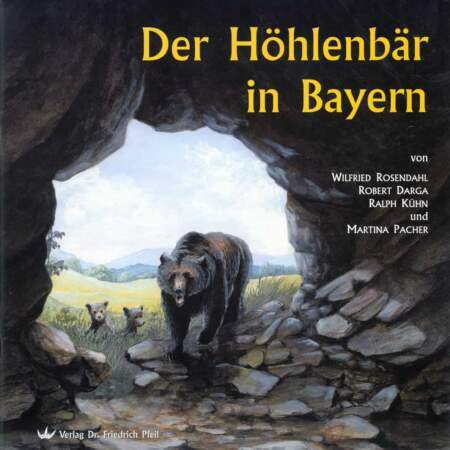 The book provides a complete coverage of the Escuminac fossils and their paleoenvironment. A historian, a sedimentologist, a geochemist, a palynologist, paleobotanists, and paleozoologists from five countries contributed to reviving this 365 million years old ecosystem. Every species of plants, invertebrates, and fishes of the Escuminac Formation are described, abundantly illustrated, and placed in the tree of life. 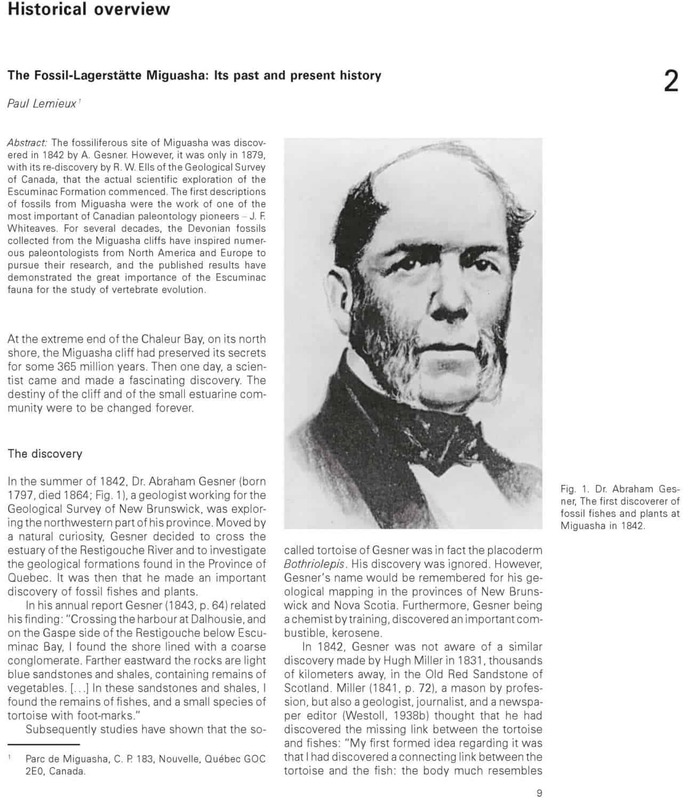 Miguasha is a time-capsule that significantly enhances our understanding of the Late Devonian as a step in our own evolution. Since December 1999, Miguasha Park was inscribed on the UNESCO World Heritage List. In its representation of vertebrate life, Miguasha is the most outstanding fossil site in the world for illustrating the Devonian as the “Age of Fishes”. The area is of paramount importance in having the greatest number and best preserved fossil specimens found anywhere in the world of the lobe-finned fishes that gave rise to the first four-legged, air-breathing terrestrial vertebrates – the tetrapodes. In North America, the book is sold directly at Miguasha Park and for further information, you may contact parc.miguasha@sepaq.com or arsenault.marius@sepaq.com. The fossil site of Miguasha was discovered in 1842 and forgotten for a few decades. 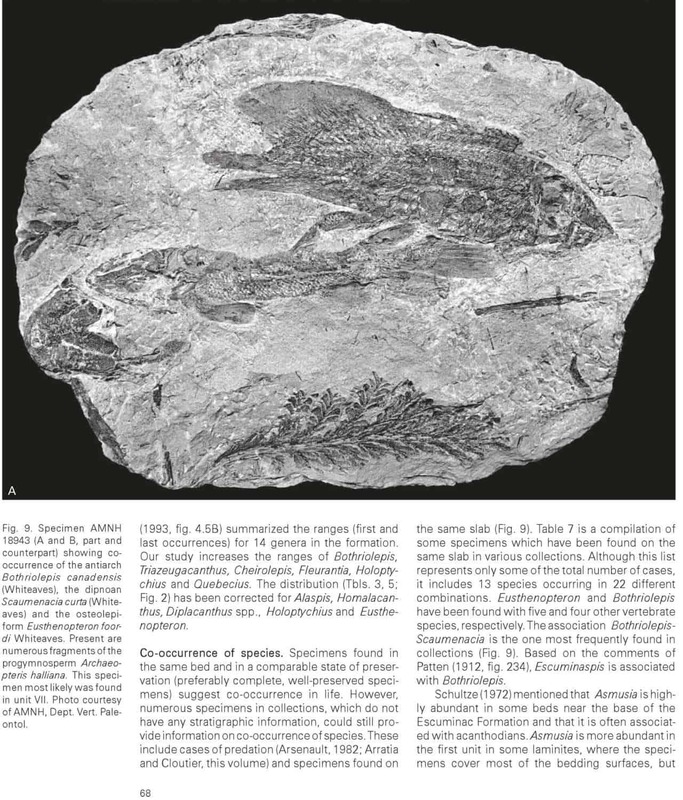 Its rediscovery in 1879 ignited many papers on fossil fishes by the Canadian paleontologist Whiteaves (LEMIEUX, this volume). Whiteaves referred to the site as the Baie des Chaleurs or Scaumenac Bay. For over a century, the site was known worldwide as “Scaumenac Bay.” Since the creation of the Parc de Miguasha in 1985, Miguasha is the official geographic name for the site of the Escuminac Formation. 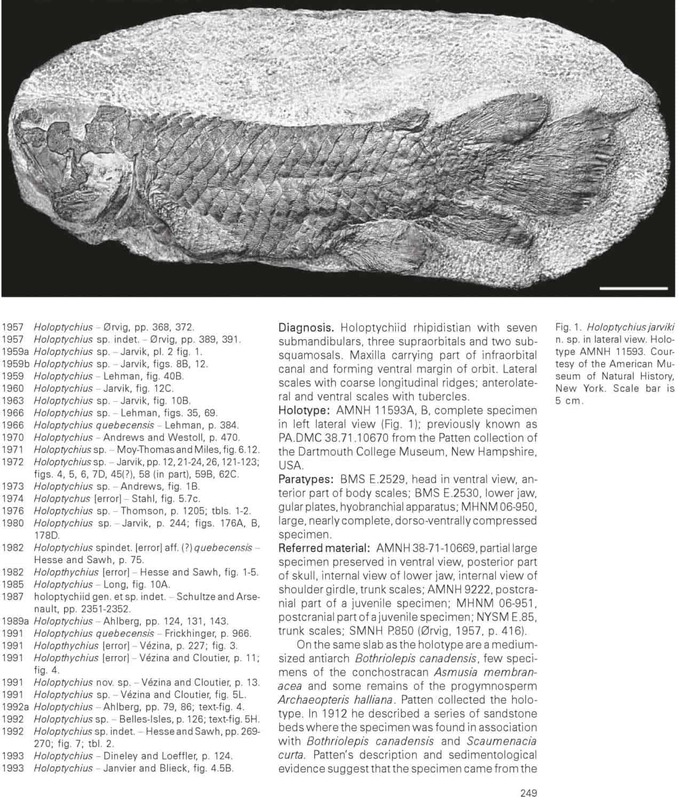 Fossil fishes from Miguasha immediately became the focus of phylogenetic discussions. 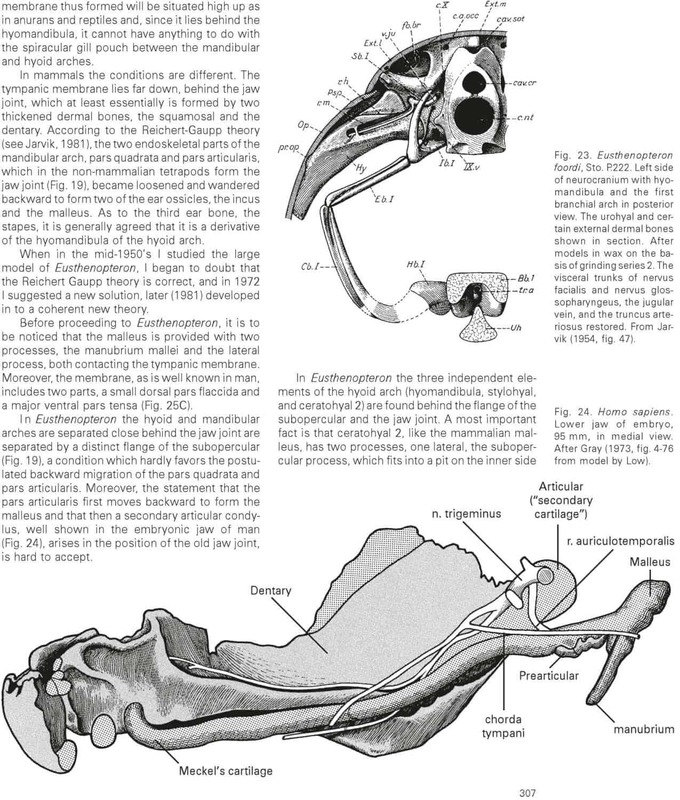 As early as in 1892 COPE used Eusthenopteron from the Escuminac Formation as the key example relating tetrapods to osteolepiform crossopterygians in contrast to dipnoans. 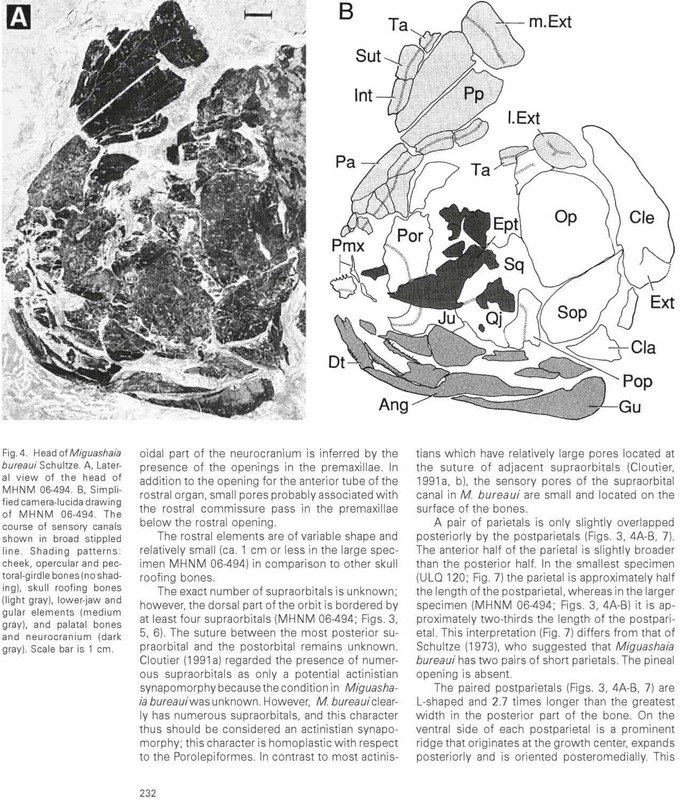 JARVIK focussed his lifelong research on Eusthenopteron so that the morphology and anatomy of this fossil fish is now known better than that of any other fossil and most Recent fishes (CLOUTIER, this volume). 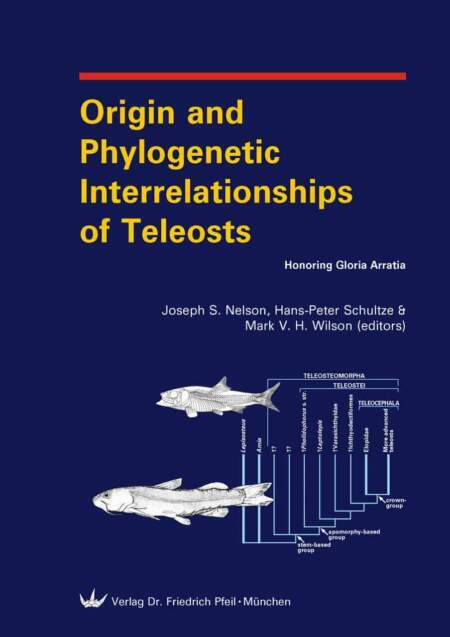 According to JARVIK (this volume), the osteolepiform Eusthenopteron presents already in the Devonian all basic tetrapod (including human) features. 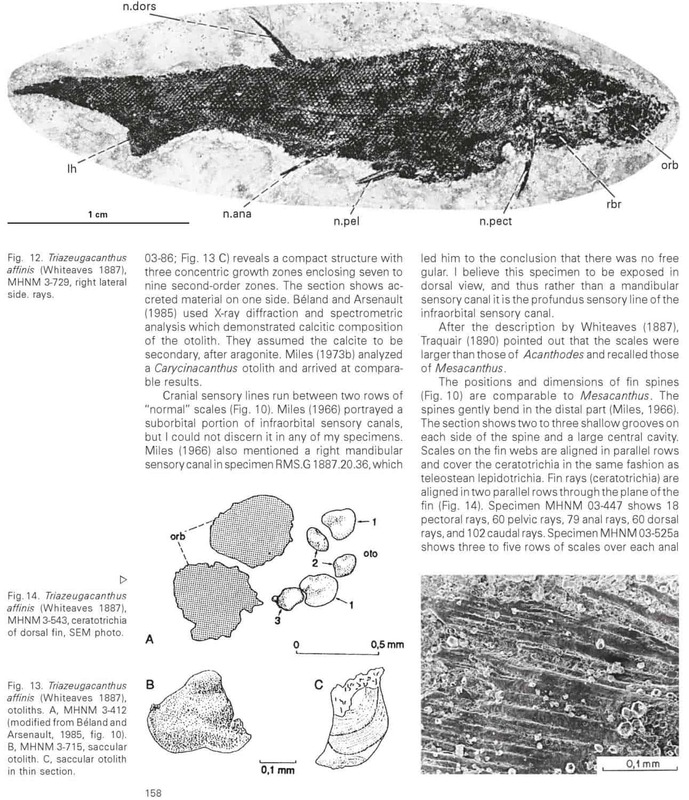 The fish in the Escuminac Formation closest to the tetrapod level is Elpistostege (SCHULTZE, this volume), which was first described as a tetrapod. 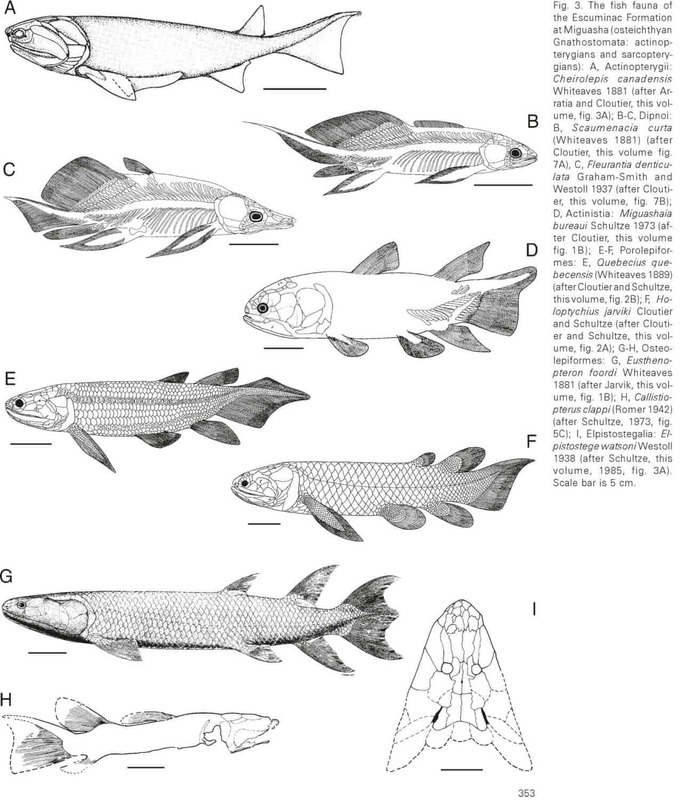 Other than for the origin of tetrapods, the Escuminac fishes are crucial to our understanding of the origin of ray-finned fishes (ARRATIA and CLOUTIER, this volume) and coelacanths (CLOUTIER, this volume). 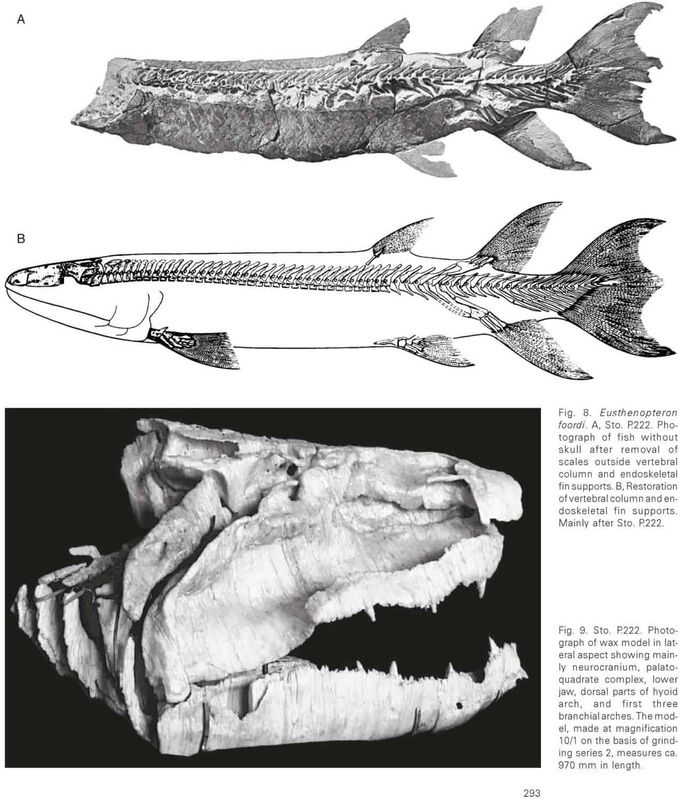 The placoderm Bothriolepis and the lungfish Scaumenacia are so common at the site and so well preserved that they became representatives of their respective groups in exhibits and teaching collections all over the world. The richness of fossil fish at Miguasha drew expeditions and collectors from North America and Europe since 1879. Local collectors could supplement their income by selling fossil fishes. All that has stopped with the creation of the Parc de Miguasha. New finds are stored and curated now in the museum of the park (Musée d’Histoire naturelle de Miguasha) which has the largest collection of Escuminac fossils in the world (PARENT and CLOUTIER, this volume). Since the descriptions of fossil fishes by WHITEAVES and of fossil plants by DAWSON, the number of taxa from Miguasha has more than tripled. 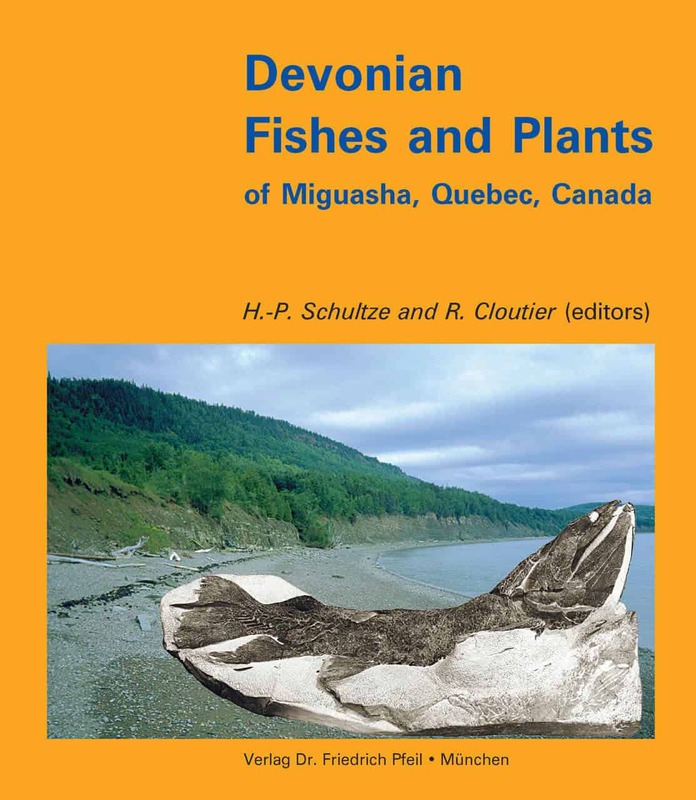 Apart from ØRVIG’s (1957) compilation of the fish assemblage and the sedimentological and paleoenvironmental interpretation by DINELEY and WILLIAMS (1968), this book presents the first comprehensive description of the history, geology, paleoenvironment and fossil content of the Upper Devonian site of Miguasha. For the past 25 years, the paleoenvironment of the Escuminac Formation has generated a great deal of controversy. Originally interpreted as a lacustrine environment by DINELEY and WILLIAMS (1968), recent evidence suggests that the Escuminac Formation was deposited in a coastal marine environment (SCHULTZE, 1972; SCHULTZE and ARSENAULT, 1985; VÉZINA, 1991; SCHMITZ et al., 1991; HESSE and SAWH, 1992). The present account gathers further indications for a non-freshwater environment (PRICHONNET et al., CHIDIAC, MAPLES, SCHULTZE and CLOUTIER). Although not as controversial as the paleoenvironment, the paleogeography of Miguasha also is a debated topic. During the Devonian, Miguasha was under equatorial climate as given by the position of paleocontinents (SEGUIN, this volume). The climatic conditions are reflected in the presence of terrestrial scorpions (Jeram, this volume) and luxurious plants which grew in the continental area near Miguasha (GENSEL and BARNETT-LAWRENCE, this volume). Despite a rich palynomorph assemblage (McGREGOR, this volume), the megaflora shows only low diversity, an indication of distance from the coastline and/or destruction by transport. 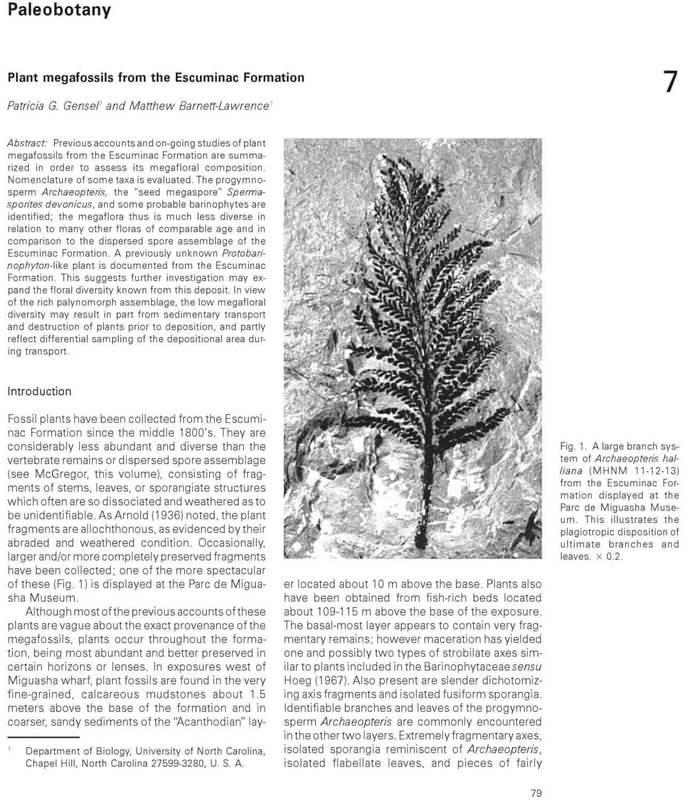 A new plant is documented for the Escuminac Formation (GENSEL and BARNETT-LAWRENCE, this volume). No palynomorphs suggesting marine conditions are reported by McGREGOR (this volume), but on the other hand acritarchs, yet to be described, are known from the lower part of the formation (SCHULTZE and CLOUTIER, this volume). 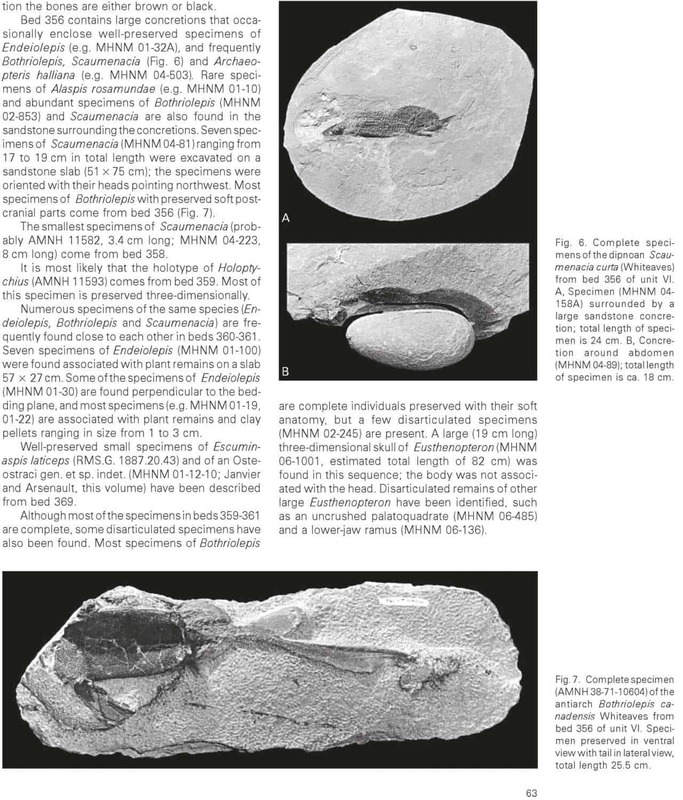 Although poor in invertebrate taxa, JERAM (this volume) and MARTENS (this volume) describe three arthropod taxa from the Escuminac Formation, including the first North American stylonuroid eurypterid. The first trace fossils are recorded from the Escuminac Formation; they indicate a marginal marine environment (MAPLES, this volume). The entire vertebrate assemblage is revised, including some of its paleoecological interactions (McALLISTER, this volume). 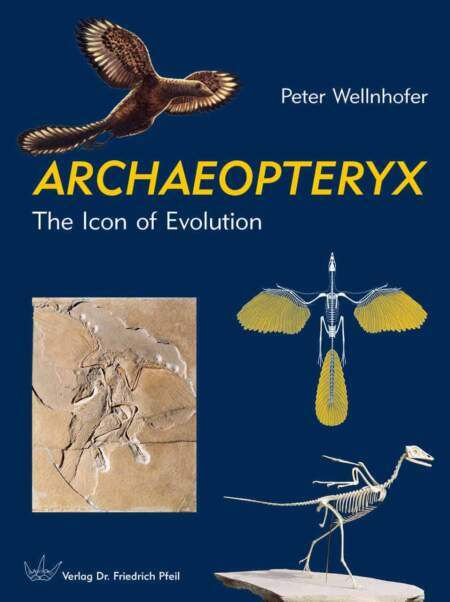 Twenty-one species are known, including four new taxa described in this volume (Osteostraci by JANVIER and ARSENAULT, Acanthodii by GAGNIER, Porolepiformes by CLOUTIER and SCHULTZE). The agnathans are unique and include the last survivors of the Paleozoic armored agnathans (JANVIER, this volume; JANVIER and ARSENAULT, this volume). The antiarch Bothriolepis (VÉZINA, this volume), the acanthodian Triazeugacanthus (GAGNIER, this volume), the lungfish Scaumenacia (CLOUTIER, this volume) and the osteolepiform Eusthenopteron are the most abundant taxa, the acanthodian Homalacanthus and the actinopterygian Cheirolepis are less common, and all other taxa are rather rare (PARENT and CLOUTIER, this volume). Most major groups of Devonian fishes are represented in Miguasha, with the exception of heterostracan agnathans, chondrichthyans and onychodontiforms. The volume closes with a comparison of the fish assemblage of Miguasha with other contemporaneous assemblages (SCHULTZE and CLOUTIER). The ichthyofauna is highly endemic at the species level (20 of 21 species are unique), whereas at the generic level it is similar to far distant localities in Ellesmere Island, Scotland and Russia, and at the familial level it is reminiscent of one locality in Australia. Matthew BARNETT-LAWRENCE, Department of Biology, University of North Carolina, Chapel Hill, North Carolina, U.S.A.
Patricia G. GENSEL, Department of Biology, University of North Carolina, Chapel Hill, North Carolina, U.S.A.
Christopher G. MAPLES, Kansas Geological Survey, The University of Kansas, Lawrence, Kansas, U.S.A.
James McALLISTER, Museum of Natural History, The University of Kansas, Lawrence, Kansas, U.S.A.